For months now, at dawn, you can smell Autumn close to the ground – that coolness, that smell of the earth and leaves changing is tangible. It’s not quite Chicken and Leek Pie followed by Chocolate self-saucing pudding and a small heap of fresh whipper cream season, nor is it the days when you exist on homemade sorbets – it’s somewhere in between. The perfect food for this season will always be a combination of what is In Season; it’s fresh, you won’t need a bank loan to buy it, and as with all seasons, what comes in season is usually what your body needs to maintain peak fitness and healthiness. Autumn is Nicoise Salad with a twist season here. Thick steaks of wild caught tuna can be bought in that great fish shop at Mona Vale and in season green beans, potatoes, plump tomatoes still available, maybe even some roasted eggplant tossed in for extra taste, are combined for something not too heavy and not too light. A traditional Nicoise salad usually includes raw red peppers, shallots, artichoke hearts, anchovies, boiled eggs, tomatoes and Nicoise olives and other seasonal raw vegetables, but according to many sources, excludes cooked vegetables, such as green beans and potatoes, those items in variations of salade niçoise served around the world. The fundamentals can be adjusted though, it’s the combination of tastes that make that ‘yum’ in the mouth and will give you pure vim at dawn. Although many will tell you to use canned tuna it is well worth allowing yourself to have the fresh version, cooked rare to medium or just seared. Anchovies are a love them or leave them option too – we love them, they’re always in. At the other polarity end of Spring, when many will serve this salad, is Autumn, and that’s a time of year that suits this dish too. Cook the potatoes in a saucepan of boiling water for 10 minutes or until just tender. Pop the eggs in when you turn the potatoes off – the residue heat will cook them so they’re not too hard. Use a slotted spoon to transfer the potatoes to a chopping board. Halve. Add the beans to the pan and let these rest in the residue heat too. This will take away some of their crispness but still keep them bright green and with some crunch. Refresh under cold running water. Drain. Peel your eggs, wash your lettuce, tomatoes, drain the olives from their brine. Add these with anchovies, beans and torn parsley to a large salad bowl ready to dress. Whisk together the oil, vinegar, mustard and sugar in a jug until combined. Season with salt and pepper. We also use a good quality Caesar Dressing as an alternative – extra anchovies in this! Heat a frying pan over medium-high heat. Add tuna and cook for 2-3 minutes each side for medium or until cooked to your liking. Set aside for 5 minutes to rest. Flake the tuna into large pieces or leave as one piece to place on your salad base. Toss your salad so dressing evenly coats all ingredients. Divide the evenly among serving plates. 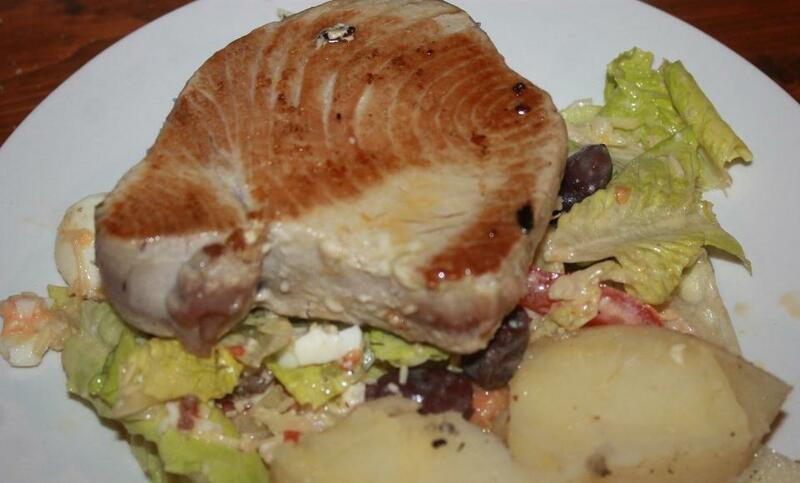 Place tuna atop salad mix and a few seasoned potatoes to the side. Eat!